It is a rainy November night in Seattle, and I am tooling north on I-5 with an old college pal, a wacky artist who nails canvas on the walls, and spinning around the room on roller skates and carrying a paint gun, executes four masterpieces simultaneously. “Jefferson Airplane,” we intone together. Well, no. The songs are all different from one another. But my guess is that if you listen to this cd, you’ll find yourself thinking just like my friend and me. Resembling the music of the sixties and seventies that informs these tunes, the selections are various and exciting, the musicianship solid, and the live- performance sound refreshing. Krug, herself, wrote most of these songs, and many of them have the tight, smoky atmosphere of a basement tavern with a linoleum floor, and the in-your-face feeling of musicians met by an audience at close terms. This is the kind of band for whom a nightclub venue is perfect, and when we listen to this cd it’s where we want to be. Several of the pieces are real standouts. There is no denying the catchiness of a tune like “Marshmallow.” “Marshmallows, baby, are deceptive little sweets/We can burn you real badly when exposed to too much heat.” Yes, you can. The aforementioned “Skeletons” contains the sharp musicality that distinguishes the genre called “classic” rock. Others, notably “Avalanche Wind,” “Mama Didn’t Raise No Fool,” written by Tom Krug and “Drifting,” have the brave, world- weary tone that might be considered trademark of Krug’s work; that is, it might be if we had more to go on. With only the cd here under discussion, and three more singles available for listening on line, it seems to be too early to make assertions. Still, we see her frequently making claims against her vulnerability. Another track I enjoy is “Better By Now,” partly because of the gentle harmonies that explore rather than insist upon the melody, and partly because of the lyric, which addresses the joylessness of addictive behavior. The piling up of “I should know”s is pleasing, hypnotic, and the logic is irrefutable. Even the rush itself becomes stupid after awhile, the speaker tells us. 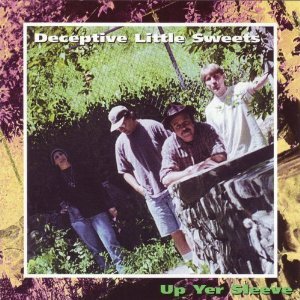 Up Yer Sleeve’s Deceptive Little Sweets breaks no new ground, musically speaking. In fact, in some ways it’s very much throwback music, and familiarity is the source of the comfort and joy we feel in it. It bespeaks an era of certain innocence in the blues-rock genre. These are the songs you’ve never heard, but already know.